The report identified four areas in which DPH and partner organizations could act to develop a sustainable CHW program: infrastructure, professional identity, workforce development, and financing (see Table 1). 12 The report also proposed recommendations in each area. To understand how states are using law as a tool to develop sustainable CHW programs, this fact sheet summarizes the extent to which states have enacted laws addressing CHW infrastructure, professional identity, workforce development, and financing. Establish a CHW advisory body to assist with the development and implementation of a sustainable program. Encourage the adoption of the term “community health worker,” a unified definition of CHW core competencies, and a common scope of practice. Integrate the role of CHWs into training for health care providers. Develop statewide infrastructure for CHW training and education. Develop a CHW certification process and training curriculum, including defined core competencies and skills. Require continuing education and recertification. Include CHW services in Medicaid administrative cost claims. Integrate CHWs into managed or team-based care models. Increase and sustain grant funding for outreach. Provide incentives for private insurers to use CHWs. The research team collected and reviewed laws (statutes, legislation, and regulations) in the 50 states and District of Columbia that were in effect as of December 31, 2012. The team used two search engines: Westlaw (Thomson Reuters, Eagan, Minnesota) and State Net (LexisNexis, Sacramento, California). Findings were cross-referenced with Internet legislative and administrative code sites for each jurisdiction. Search terms included “community health worker” and 23 alternate terms identified by subject matter experts. Laws were coded according to the level of authority specified (e.g., required, authorized, or prohibited). 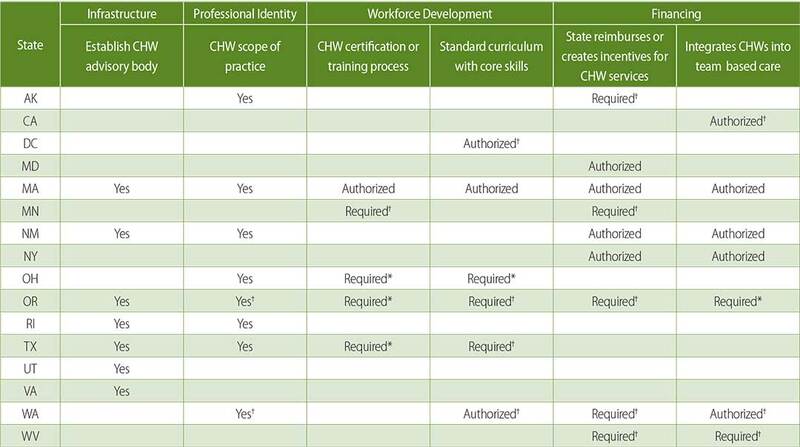 As of December 31, 2012, 15 states and the District of Columbia had enacted laws addressing CHW infrastructure, professional identity, workforce development, or financing (see Figure 1 and Table 2). Six state legislatures created an advisory body or ordered a study to investigate the impact of CHWs on achieving health care savings or eliminating health disparities. Following release of these studies, Massachusetts and Oregon enacted additional laws to regulate CHWs. Of eight states that codify a CHW scope of practice, three specify a role for CHWs in chronic disease prevention and care. For example, Rhode Island established the Commission of Health Advocacy and Equity in 2011, which engages CHWs to reduce disparities in disease prevention, chronic diseases, and family services. 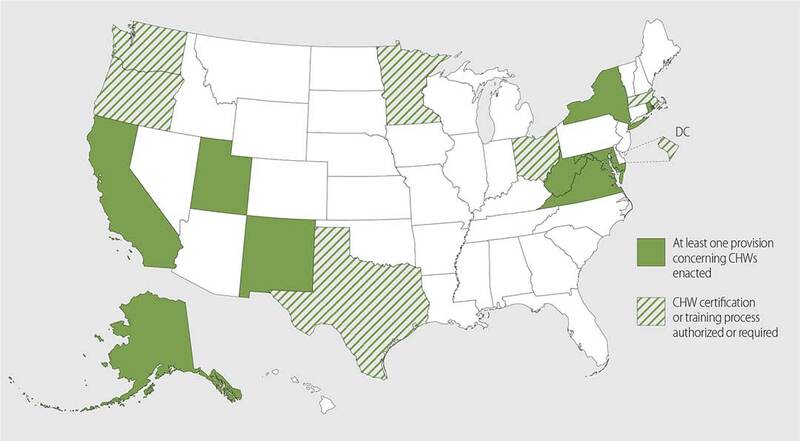 Five states have enacted workforce development laws that create a certification process or require CHWs to be certified. Six states authorize the creation of standardized curricula on the basis of core competencies and skills, and four of those states authorized a certification board to set education requirements and oversee the certification process. Seven states have laws authorizing Medicaid reimbursement for some CHW services. No state requires CHW coverage by private insurers. Some states, such as Texas, grant the authority to explore CHW reimbursement mechanisms to a commission. In 2012, as part of an effort to address health disparities, Maryland authorized the creation of health enterprise zones in which CHWs and their employers are eligible for tax incentives. Seven states have enacted laws to encourage or require the integration of CHWs into team-based care models for at least some health care organizations or services. The scientific evidence base demonstrates the value of CHW services to improve health care outcomes and reduce costs. This evidence supports state initiatives to incorporate CHWs into the health care delivery system. As states examine strategies to improve health outcomes, reduce health care costs, and reduce health inequities, they can consider using law as a tool to establish sustainable CHW programs, to include creating supportive infrastructure, addressing professional identity, and developing workforce and financing mechanisms. Empty cells indicate that state law is silent on this issue or no law was identified. Yes indicates state law either authorizes or requires in full or in part the select recommendation. *State has multiple enacted laws with varying degrees of authority. †Law has exceptions or only applies in certain circumstances (i.e., tuberculosis control). Witmer A. Community health workers: integral members of the health care work force. Am J Public Health. 1995;85:1055. Balcazar H, Rosenthal L, Brownstein JN, Rush CH, Matos S, Hernandez L. Community health workers can be a public health force for change in the United States: three actions for a new paradigm. Am J Public Health. 2011;101:2199–203. Health Resources and Services Administration, Bureau of Health Professions. Community Health Worker National Workforce Study. Washington, DC: US Dept of Health and Human Services; 2007. Allen JK, Dennison-Himmelfarb CR, Szanton SL. Community Outreach and Cardiovascular Health (COACH) trial: a randomized, controlled trial of nurse practitioner/community health worker cardiovascular disease risk reduction in urban community health centers. Circ Card Qual Outcomes. 2011;4:595–602. Heisler M, Spencer M, Forman J, Robinson C, Shultz C, Palmisano G, et al. Participants’ assessments of the effects of a community health worker intervention on their diabetes self-management and interactions with healthcare providers. Am J Prev Med. 2009;37(6 Suppl 1):S270–9. Centers for Disease Control and Prevention. Addressing Chronic Disease Through Community Health Workers: A Policy and Systems-Level Approach. Atlanta, GA: Centers for Disease Control and Prevention; 2011. Whitley E, Everhart R, Wright R. Measuring return on investment of outreach by community health workers. J Health Care Poor Underserved. 2006; 17(1 Suppl):6–15. Martinez J, Knickman JR. Community Health Workers: A Critical Link for Improving Health Outcomes and Promoting Cost-Effective Care in the Era of Health Reform. New York: New York State Health Foundation; 2010. Institute of Medicine. Unequal Treatment: Confronting Racial and Ethnic Disparities in Health Care. Washington, DC: National Academies Press; 2002. Institute of Medicine. A Population-Based Policy and Systems Change Approach to Prevent and Control Hypertension. Washington, DC: National Academies Press; 2010. Rosenthal E, Brownstein J, Rush C, Hirsch GR, Willaert AM, Scott JR, et al. Community health workers: part of the solution. Health Aff (Millwood). 2010;29:1338–42. Anthony S, Gowler R, Hirsch G, Wilkinson G. Community Health Workers in Massachusetts: Improving Health Care and Public Health. Boston: Massachusetts Department of Public Health; 2009. This fact sheet presents a summary of laws in effect as of December 2012 and is not intended to promote any particular legislative, regulatory or other action. Learn more about State Law Fact Sheets at www.cdc.gov/dhdsp/pubs/policy_resources.htm.